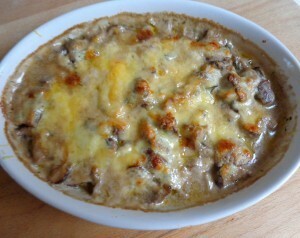 This French-Russian dish of mushrooms, cream and cheese may be made with or without béchamel sauce. The version presented here, which does use cream sauce, is adapted from the wonderful Russian cookbook Please to the Table by Anya von Bremzen and John Welchman, to whom I am indebted for many of the Russian recipes I use in my Paris kitchen. Which mushrooms to choose? Cultivated white mushrooms are most commonly used for this dish, known in Russia as zhulien. But wild mushrooms — chanterelles, porcini or shiitake — will add exceptional flavor if they are in season. Start by making 1 cup of béchamel sauce — half the recipe on this site. Oil 6 individual ramekins or a medium-sized gratin dish. Preheat the oven to gas mark 7 (425 F., 220 C.). Carefully clean the mushrooms and spin them dry in your salad spinner. Trim the stems. Cut the mushrooms in half, and cut the halves into slices. Peel and halve the garlic. Heat the olive oil in a heavy-bottomed pan. When it sizzles, add the onions. Sauté over medium heat, stirring, until the onions have wilted, about 2 minutes. Add the mushrooms and the garlic halves. Turn up the heat to medium-high and continue cooking, stirring occasionally, until the mushrooms start to brown. Remove the garlic and turn off the heat. Add the cream to the mushrooms. Stir in 1/2 cup of the béchamel sauce, the wine and the fresh herbs. Transfer to your gratin dish. Spoon on the rest of the béchamel. Top with the grated cheese. Bake for 15 minutes, or until the dish is bubbly and starting to brown. Serves 6. Is it really necessary to remove the garlic at the end of this recipe? Looks fabulous, will definitely give this a try. Hi John. It’s not essential to remove the half cloves of garlic — it’s mainly esthetic. Do give it a try, and let us know how it turns out! This is great. I had only some slightly beat-up white mushrooms to work with, some two-week-old semi-fresh dill — and some very good comté cheese. Start to finish it took longer than I expected – an hour, including cooking time – but that may have been my own doltishness. And the result: SPIFFING. Looked just as good as in the picture, too! My husband (who is originally East European) said simply: “That’s a superb recipe.” To us, it was the dill (use the full quantity suggested!) that made it so special. Next time I’ll try it with a mix of white & wild mushrooms, I’m sure it will be even better.